After a less-than-exciting first round in the playoffs, NBA fans can look forward, finally, to sinking their teeth into an epic Spurs-Thunder matchup in round two. OKC’s Kevin Durant and Russell Westbrook are two of the best offensive talents in the game, and they’re facing down a 67-win Spurs team with a historically great defense. In terms of points allowed per 100 possessions, San Antonio gave up just 99.0, which was 12th-best in NBA history and 7.4 points better than the league average. In other words, reigning two-time Defensive Player of the Year Kawhi Leonard is leading a unit in hailing range of the string of ’60s-era Celtics teams led by Bill Russell, and right there with the teams that fill out the top 10 all time. Given the Spurs’ dominance this season, it’s no surprise that Durant and Westbrook have never faced a defense like San Antonio’s in their playoff careers. Coming into this series, the toughest D that either has faced belonged to the 2013 Memphis Grizzlies (whose 100.3 defensive rating was 5.6 points/100 better than league average), but that defense gave up 1.9 fewer points per 100 possessions than the 2016 Spurs — more than the difference between the third-ranked Pacers and 10th-ranked Cavs this season. 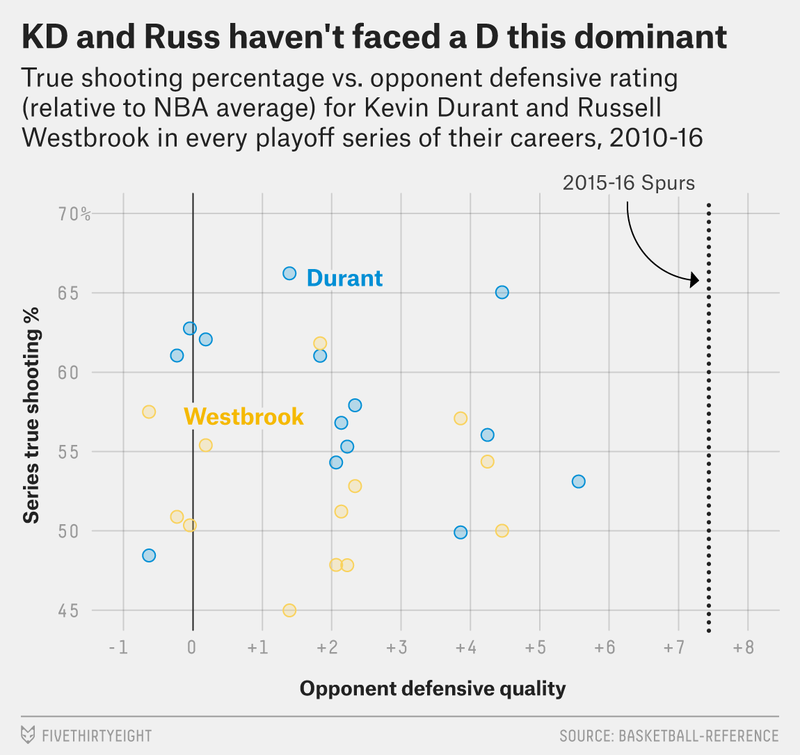 If there’s good news for the Thunder, however, it’s that Westbrook and Durant have scored just as efficiently against tough defenses in the playoffs as they have against weaker ones. And it may be because of their collective ability to knock down difficult shots. Durant, for instance, frequently knocks down shots few other players can consistently make. As a result, he ranks as the NBA’s third-best shotmaker1 according to quantified shot quality (qSQ), a new SportVU-based statistic that measures the difficulty of each shot by accounting for where the shot was taken, the proximity of the defender and other variables. As a team, the Thunder were the fourth-best shot-making squad, adjusted for the quality of their looks. They don’t always take good shots — as an out-of-control Dion Waiters drive, or a pull-up three-pointer by Westbrook attests — but they’re still better than most at making them. The Spurs are the opposite: Their defense is predicated on forcing opponents to take bad shots. As a team, San Antonio ranked as the second-best defense, behind Charlotte, in terms of suppressing their opponents’ qSQ. Part of this is due to Leonard’s relentless perimeter defense; wily veterans such as Tim Duncan and Tony Parker also offset their waning athleticism with smart positioning to cut off easy paths to the basket. However, the Spurs’ problem is that they only have one Leonard to put on OKC’s two elite scorers. During the regular season, when Leonard matched up against Durant on defense, KD scored 38 points per 100 team possessions; but when Kawhi guarded Westbrook, he held him to only 25 points per 100 team possessions. If Westbrook faces Danny Green or Tony Parker instead, his scoring rate rises to 48 and 33 per 100 team possessions, respectively. So despite San Antonio’s dominant D, individual defensive matchups will be worth keeping an eye on. Whomever Leonard and Westbrook eventually match up against, this series is also notable for both players’ emergence as superstars over the past few seasons. According to Basketball-Reference’s Box Plus-Minus metric — which estimates a player’s contribution to his team’s scoring margin while on the floor — Leonard and Westbrook rank as Nos. 1 and 3, respectively, during the playoffs (sandwiched in between is poor Chris Paul), after ranking fourth and second (amidst Steph Curry and LeBron James) during the regular season. With Paul and Curry on ice,2 there’s an easy case to be made that this Spurs-Thunder series features two of the three best players remaining in these playoffs — and that’s without even considering Durant’s place among the league’s elite. It’s just one of the many twists adding intrigue to what should be a must-watch series. We knew the Western Conference’s second round would offer some of the best matchups of the entire playoffs, and Spurs-Thunder is shaping up to be the best of them all. For players attempting 500 shots or more in the 2015-16 season. Curry may return later in the playoffs.